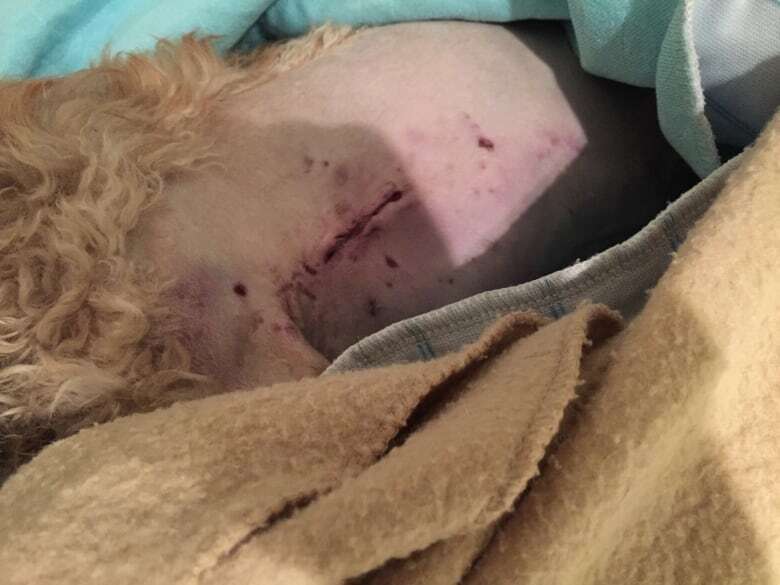 By-law officers with Victoria's Capital Regional District [CRD] are looking for a mixed-breed pit bull and its owner after it allegedly attacked Paul Johnston's three-year-old maltipoo on Mount Finlayson last Saturday. Cooper died in surgery the following day from a blood clot. "If a dog attacks another animal, or injures or kills another animal, we would declare the dog dangerous," said Don Brown, chief by-law officer with the Capital Regional District. "That's almost a given." Following the attack, at least four people have come forward saying they have also had incidents with a pit bull cross matching the same description — predominantly white with brown or black spots. Kerry Oetting says she believes she ran into the animal while with her three dogs a few months ago at Thetis Lake. She said she had to cover her animals with a jacket to prevent a similar attack. Oetting has also complained about the animal to the CRD. "It's a matter of time before he kills," she said. By-law officers say the owner they are looking for is a white male, five feet seven to five feet nine inches tall with multiple tattoos on his upper body. On Saturday Paul Johnston and his dog Cooper were making their weekly hike up Mt. Finlayson in popular Goldstream Provincial Park, close to Victoria. At the summit, he says they encountered a mixed breed white pit bull, which got away from its owner and charged Cooper clamping its jaws around the maltipoo's neck and belly. Johnston required stitches to his fingers after struggling to free Cooper. Unfortunately Cooper died of a blood clot Sunday after undergoing surgery to repair the damage caused in the attack. 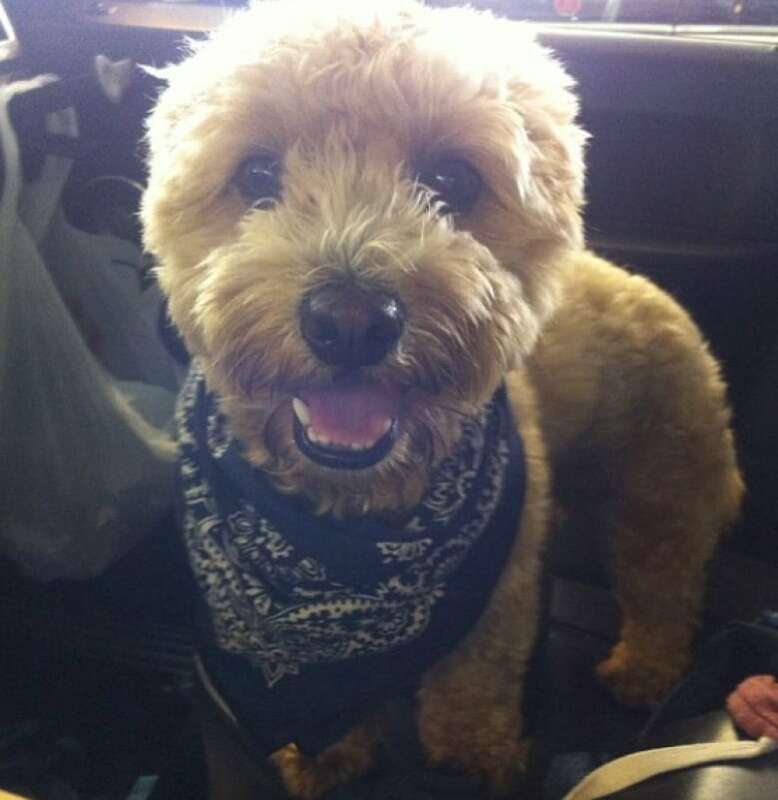 "He was a small dog with a big heart," said Johnston. "For me, that wasn't fair to him, something like that. He would never do that to anybody else." Johnston says after the attack, the mixed pit bull and its owner vanished down the mountain. Brown says the public might be able to help identify the offending dog and its owner. "In the case like this, I mean this was on a trail, so probably people can get a good description of the person, the dog, and a license number for the vehicle," he said. "I mean, that certainly would be very, very helpful for tracking down the owner." He says there are between 50 and 75 serious dog attacks every year in the district. Brown encourages people to report any type of altercation. In this case he is hopeful by-law officers will catch up with the owner so another incident can be avoided. Owners with dogs deemed dangerous must muzzle and leash their animals in public. Johnston says neither animal involved in this latest incident was on a leash at the time even though the provincial park requires animals to be leashed at all times.